Sitting out at our lemonade stand was such a joy! Not only did I get to hang out, do preschool, read and sing with my little ones during the down time, we also got to meet many of our neighbors and just hear the stories of passer-bys. One couple were even missionaries from Africa here on leave! As they drank their lemonade, they told us about how the believers were faring in their area and the woman commented, “There, now you have refreshed us with lemonade, and we have refreshed you with news of your brothers and sisters in Africa!” And it was true! It was perfect! This was the page we were doing in his preschool book! 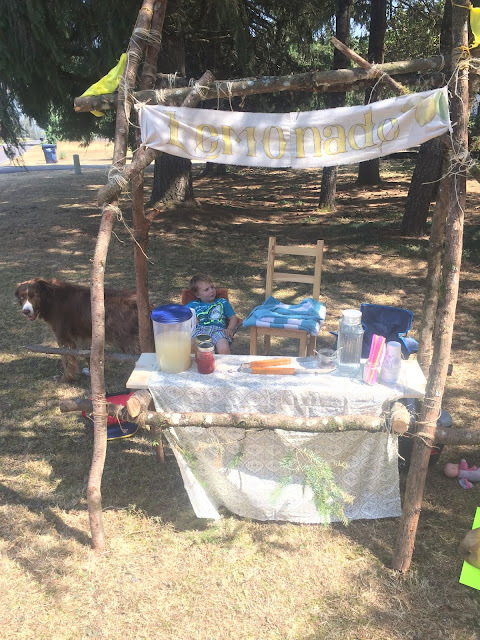 We had several people just want to take pictures of our stand (feel free to read up on the instructions for the lashed branch stand) and nearly everyone comment on how pleasantly surprised they were that the lemonade had such wonderful flavor. I actually had to agree. That sounds totally conceited, but let me explain. I really don’t like lemonade. I know it's horrible, but I’ve just never really had much of a taste for the drink. So for me to admit I like it is saying something. I had several people request the recipe on the spot and it was easy to give because the recipe was so simple. The kids and I tried to restrain ourselves, but we still ended up drinking about a quarter of the lemonade we made. Set 1 ½ cups of water to boiling while you quarter the lemons and toss them into the blender. When the water is hot, stir it into the sugar to dissolve, then pour it into the blender as well. Add remaining water (if it doesn’t all fit in, you can add the rest to the pitcher.) Start out on lowest setting and allow blender to agitate the juice from the lemon quarters for a minute or so. I waited until the water was just becoming opaque. You don't want to grate the rinds. Then pour through strainer (to catch all the rinds and seeds) into the pitcher. Cool (or ice) and done! *I want to note, this will yield a fairly sweet lemonade, so if you prefer it to be more on the tart side, you may want to adjust this amount. Just kitty-corner from our house is a farm stand called Me and Moore that sells the most amazing peaches right now! They’re seriously like candy! The kids, Clancey dog and I walked over and got a bagful. They found some pretty little wildflowers on the way and each picked one for the lady who always works at the counter. She’s such a sweetheart and always has a nice conversation with the kids when we’re there! Once we got home, I followed this recipe for the syrups: I didn’t know at the time that the lemonade would be able to stand on its own! But it’s still fun to add a little flavor, even if just for variety’s sake, from time to time. In fact, nearly everyone who came by requested flavoring added in. A spoonful or two was more than enough for the flavor to come through. Bring the water to boil in a saucepan. Dissolve sugar into boiling water, turn down heat to medium, then stir in fruit. Allow to simmer for 5 minutes or until it has thickened, stirring intermittently. Pour into jar and refrigerate until use. I did a batch of strawberry also and they both turned out so tasty! And they looked so cheery sitting on the stand together! I understand life is sometimes too crazy even for this, but I picked up another flavoring cheat I wanted to pass on if you need to save some time: jam or preserves! I had a little bit of my mom’s blackberry jam and just added a splash of water to a spoonful to thin it out a bit. Stirred into the lemonade it turned out great! If you're looking for another syrup recipe, Sweet C Designs makes a very similar version that looks super yummy, too!